Click here to see the book's trailer, made by the youngest member of our family when they were only 12. Meg Pickel's older brother, Orion, has disappeared. One night, she steals out to look for him and makes two surprising discoveries: she stumbles upon a séance that she suspects involves Orion, and she meets the author Charles Dickens, also unable to sleep and roaming the London streets. He is a customer of Meg's father, who owns a print shop, and a family friend. 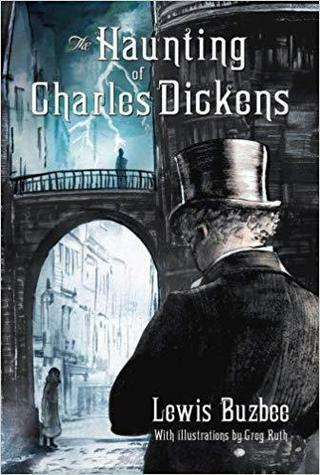 Mr. Dickens fears that the children of London aren't safe and is trying to solve the mystery of so many disappearances. If he can, then perhaps he'll be able to write once again. 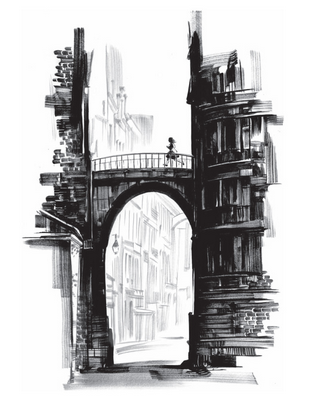 With stunning black-and-white illustrations by Greg Ruth, The Haunting of Charles Dickens is a literary mystery that celebrates the power of books and brings to life one of the world's best-loved authors. "Deliciously elaborate… The sights, sounds and stenches of 19th-century London are palpable even without the moody black-and-white illustrations." "A rollicking good historical mystery, written in Dickens'style and illustrated with appealing line drawings, which include a subtle tip of the hat to a more contemporary London that a few YA readers may catch." "A charming and gripping tale...Buzbee creates solid characters (and certainly has fun naming them, as did Dickens) and an authentic flavor of Dickensian London, enhanced by Ruth's striking and evocative b&w drawings...while addressing issues of feminism, the search for identity, and child abuse." "[A] seriously good book...Buzbee draws a realistic vivid picture of 19th century London and manages to capture the "feel" of a Dickens book...The importance of the written word, the printed word, and the authors behind them shines through in this novel." LONDON. Mid-summer night nearly upon us. Meg Pickel stood, as she had every night for six months now, at the edge of her family's roof-garden, and stared into the City, towards the massive black dome of St. Paul's Cathedral. It was nearly time, she knew, for the midnight bells to begin their ringing. Each night, in the brief moment before the bells first rang, the whole of the City grew unnaturally calm. Not a coach wheel turned, no horse collar chimed, not one child cried out for its mother—a perfect quiet. St. Paul's sounded the first note, low and booming, as if the cathedral itself were an enormous bell struck by the City's legendary giants, Gog and Magog. Immediately the bells of a hundred other churches began striking all around Meg, a great hammering of bells, and soon the sky was nothing but bells, bells, bells. Like pebbles dropped into a still pond, each bell created a ripple of sound in the sky, great leaden circles that flowed outward. Meg leaned forward into the night, and the crashing ripples of the bells washed over and through her. Then the final stroke landed, and the bells stopped their ringing, and the leaden circles dissolved into air. Midnight again. One day ended, another newly started. One more day without her beloved brother Orion. This was Meg's favorite moment of the day, for in the great clang and crash of the bells, she could forget about her brother and the six months he had been missing, could forget about his handsome face and how it still laughed before her, even though he was not there. When the bells were ringing, she could stop imagining what horrible fates might have overtaken him. But the bells always stopped, and Meg was filled once again with nothing but Orion's absence. Winding her way through the roof-garden's potted plants, she settled on a low bench—as she had every night for the last six months. She scanned what few stars shone, looking for the constellation that shared its name with her brother, Orion the Hunter. But Orion was a winter constellation and would not rise again until the autumn, when on clear nights, its bright and easily known shape—the three stars of Orion's belt—seemed to leap out of the sky. Tonight, though, the sky was a haze of soot and gas-light, and no constellations made their patterns known to her. As she had done every night for the last six months, Meg turned her fancies to the many ways Orion might return. This was a game at which she excelled. If she could no longer imagine his return, then she had given up hope, and she would not give up hope—not yet.